Discussion in 'Latest US & World News' started by free man, Mar 14, 2019. According to this Guardian article, migrant parents send their sons back to Somalia to avoid participating/being hit by the knife crimes in London. It turns out that London under Sadiq Khan is more dangerous to adolescents than third world places, riddled by terror attacks like Somalia. Is it negligence of the Mayor, or due to cover up ? They need to ban assault knives. They have beaten you to it. According to the . . . The Guardian? I suspect that they may have cut back on the police forces on purpose, so that they would have something to blame the rising numbers of knife attacks on. Must be pretty bad if migrant parents - even if it's only a few of them - are sending their children back to Somalia trying to keep them out of trouble. Indeed, get ready to register your knives. 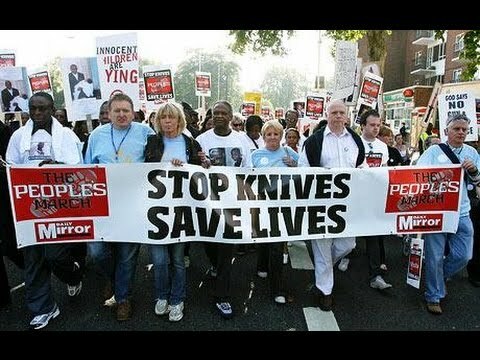 Yeah, what you don't realize is the movement to ban knives (and place all sorts of control laws on them) has become serious in the UK, in particular London. I know for someone living in Texas it's hard to believe this isn't all just satirical. The UK will continue taking people from the most violent war-torn parts of the world and think it can keep solving all the problems by passing more laws. Take a good look, this could resemble the future of the US in 80 years. Clearly, London has been culturally enriched. Well, in terms of restaurants, yes actually. Wish there was some way we could take that food without taking all those people. Is tasty ethnic food worth the worry you might get stabbed on your way walking through the park? Well I don't know. London today is like Los Angeles in the 80s. I was going to go for naive and say " it will be good for them to get in touch with their roots" but with the situation as it is in Somalia atm it's more likely they will be radicalised and sent back to the UK. So wait..somails are stabbing other Somalia in the uk? Who's doing the stabbing? With the number of bombings and deaths in Somalia since January 1 2019 I would guess these parents are either stupid or want to get rid of their children. One of the UK members of Parliament suggested they should put GPS trackers in the handles of all knives to stop knife attacks. I laughed so hard I almost soiled myself. These kids are of Somali descent. There is nothing wrong with sending them back home, if they don't like London. The Somalis need to preserve their culture and language. Sadiq Khan made the city dangerous by banning stop and search. Sadiq Khan made the city dangerous by banning stop and search. Real problem is there's no real place for all these people. They're moving to places where housing is so expensive it takes multiple people in the household to work and no family members there to look after the teenaged children. You can bet we've seen this play out in the U.S. too, it had been going on in the inner city areas for 40 years. Why do you think British people who were working in these jobs are no longer living there? Import the third world and you become the third world. Looks like Mogadishu is safer than London then? Rule Britannia? That's even more ridiculous than Asda taking knives off the shelves in their stores. Fat lotta good that'll do.